Steve Jobs told developers at last week’s Worldwide Developers Conference that the App Store now contains around 225,000 apps. By my count, about half of those are Twitter apps. 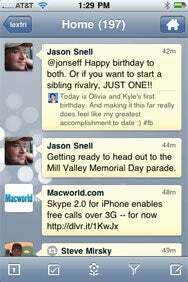 Because I’m addicted to reviewing Twitter apps for Macworld, I tackled a few more: HootSuite, Twit Pro, and three apps carrying the TwitBird moniker (TwitBird for Twitter, TwitBird Premium, and TwitBird Pro). HootSuite’s interface feels more than a bit inspired by Twitter (née Tweetie) for iPhone. It implements that app’s brilliant “pull down to refresh” mechanism, along with the “character countdown widget that expands to show other elements.” Of course, both of those features contribute to the Twitter app’s overall excellence, so they’re welcome here in HootSuite, too. Inspired by Twitter: HootSuite’s app looks and feels a lot like Twitter’s own app, with an added emphasis on statistic tracking. Developed by HootSuite Media, HootSuite is geared toward a specific class of Twitter power users. The app is built with multiple-account support as a core feature. It automatically shortens links through a custom service (ow.ly) that then tracks how well those links perform. It can schedule tweets to send at a later time. And of course, it integrates with the HootSuite.com Web service. On top of its deep Twitter integration, HootSuite can also connect to one or more Facebook accounts, pulling down the news feed. When you’re creating new posts, you can choose to send them to Facebook, Twitter, or both. Overall, HootSuite works great as a Twitter app, even if you leave some of its more powerful tools unused. (The free, ad-supported HootSuite Lite offers many of the same features, with the exception of analytics that sync with a HootSuite.com account.) The app looks lovely, and if multiple accounts are your thing, it works wonders with those. Compose Yourself: Creating a tweet in Twit Pro feels amateurish, though, to its credit, the app exposes more than 30 hard-to-type icons to include in your tweets. 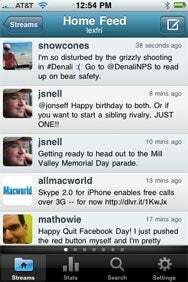 Twit Pro, a $1 app from iApp Ventures, also offers solid support for tweeting from multiple accounts. Its look, though, skews a bit towards the “good personality” side of the blind date, if you catch my drift. The timeline itself strikes me as a bit bare and oddly laid-out. To reply, retweet, or favorite a post, you must first tap a speech bubble icon, which in turn triggers an awkwardly slow animation as buttons for those actions slide into place. Composing tweets in Twit Pro features a similarly amateurish appearance. That screen does, however, include a button that exposes more than 30 icons that you can include in your tweets—but that are otherwise rather challenging to type on your iPhone. You can upload photos and videos to Facebook from within Twit Pro, but it seems to be implemented as an afterthought; you can’t pull down your news feed, nor can you directly send status updates to Facebook. Don’t get me wrong: Twit Pro is a fully functional Twitter client, and it gets the job done. But its unpolished look can’t compete with freebies like Twitter’s own app. When looking at the TwitBird apps, I spent most of my time with TwitBird Pro, a $3 offering from NibiruTech. Unlike the other two Twitter apps reviewed here, the app offers built-in push notifications—but don’t uninstall Boxcar just yet. TwitBird’s push notifications by default are limited to tweets from other users of the app. For an additional $3 in-app purchase, you can purchase “global” notifications for new mentions and direct messages from all Twitter users, regardless of which app they tweet from. No Extra Taps: When your timeline contains replies to other tweets, TwitBird displays the original tweet in a smaller font right underneath the reply. While TwitBird Pro’s design clearly takes some influence from other Twitter apps—it too incorporates the Twitter app’s “pull down to refresh” model—it implements some unique choices, too. For example, when your timeline contains replies to other tweets, TwitBird displays the original tweet in a smaller font right underneath the reply, with no extra tapping required to see the conversation. It’s pretty great. One design choice I’m less sold on is that the app requires you to return to its home screen to switch between your timeline, mentions, and direct messages. Most Twitter apps use tabs across the bottom for that purpose. While I wouldn’t say TwitBird Pro’s approach is wrong, it’s definitely different and requires a period of mental adjustment. If you connect your Facebook account with TwitBird Pro, you can optionally submit your status updates to it simultaneously as you tweet. TwitBird Pro is ad-free and supports up to 16 accounts. The $2 Premium version is similarly ad-free and supports up to two accounts. The free version does include ads, and also supports two accounts. The timeline sports a nice, speech bubble-based view, but you’ll need to tap on a tweet to expose links for translating, replying, favoriting, or retweeting. On the whole, the TwitBird interface is a refined and polished one, and the app is a pleasure to use. Frankly, given the presence of Twitter’s own, free iPhone app—coupled with the fact that said app is unequivocally exceptional—it’s awfully tough for third-party Twitter clients to compete. That’s especially true for an app like Twit Pro, which pales in comparison. And as nice an app as TwitBird is in all its incarnations, I don’t find that it offers anything better than the free Twitter app. HootSuite, however, succeeds by coupling its very elegant app with its data-driven approach, since that’s a unique service Twitter’s own client doesn’t provide.